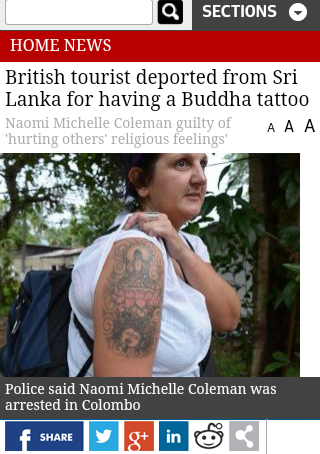 A British tourist deported from Sri Lanka for a Buddha tattoo made headlines this week. You could read about it all over the Internet. Here you have samples in English, German and Polish. An interesting perspective is, however, presented in this article: ‘No tattoos, please, we’re Buddhists – but casinos no problem!’ BBC also used this opportunity to remind the Westerners where else tattoos can get you into trouble. ‘Tattoos of memory’ is an American exhibit focused on immigrants and their hard experiences . Modern art also experienced by means of your body in form of tattoos (this time real ones) as a concept from Bytom, Poland. In Canada there’s an interesting exhibit focused on body art and indigenous cultures of Squamish and Lil’wat peoples. The Washington Post informs that there won’t be a 24-hour waiting period for tattoos and body piercing in Washington, D.C after all which is good news for people from the industry and people interested in body modification. In New Mexico you can learn much from a state ad campaign against unlicensed tattoo artists. Top 5 tattoo artists in Mexico.